Orville John Hinshaw2,3,5 [Orvil Henshaw6, John O. Hinshaw1,3,7,8,9]. Hinshaw, John O., head-of-household, age 26, born in Alabama; parents born in Alabama; rented home; occupation: farmer, general farm. Hinshaw, Nellie J., wife, age 25, born in Alabama; parents born in Alabama. Hinshaw, Ruby, daughter, age 5, born in Alabama; parents born in Alabama; attended school. Hinshaw, Ruth, daughter, age 3, born in Alabama; parents born in Alabama. Hinshaw, Orviline [unclear], daughter, age 1, born in Alabama; parents born in Alabama. Henshaw, Orville, head-of-household, age 36, born in Alabama; parents born in Alabama; first married at age 19; rented home; no radio in home; occupation: farmer, general farm; not a veteran. Henshaw, Nellie J., wife, age 34, born in Alabama; parents born in Alabama; first married at age 17; occupation: laborer, general farm. Henshaw, Ruby V., daughter, age 16, born in Alabama; parents born in Alabama; attended school; occupation: laborer, general farm. Henshaw, Ruth C., daughter, age 13, born in Alabama; parents born in Alabama; attended school; occupation: laborer, general farm. Henshaw, Orvilline, daughter, age 11, born in Alabama; parents born in Alabama; attended school; occupation: laborer, general farm. Henshaw, Opal, daughter, age 8, born in Alabama; parents born in Alabama; attended school. Henshaw, Bobbie L., daughter, age 5, born in Alabama; parents born in Alabama. Henshaw, Nancy F., daughter, age 2, born in Alabama; parents born in Alabama. Henshaw, O.J., head-of-household, age 46, born in Alabama; completed 3 years of high school; owned farm ($2500 value); occupation: farmer, farm. Henshaw, Jessie, wife, age 45, born in Alabama; completed 1 year of high school. Henshaw, Opal, daughter, age 18, born in Alabama; completed 4 years of high school. Henshaw, Boby Leey, daughter, age 15, born in Alabama; completed 2 years of high school; attended school. 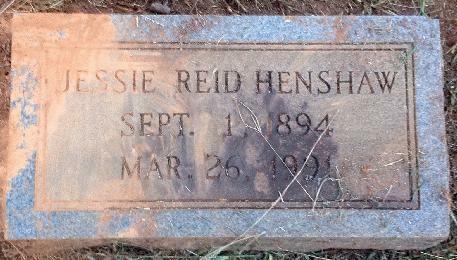 Henshaw, Nancy Fae, daughter, age 12, born in Alabama; completed 6th grade; attended school. Henshaw, Billie Joe, son, age 10, born in Alabama; completed 3rd grade; attended school. 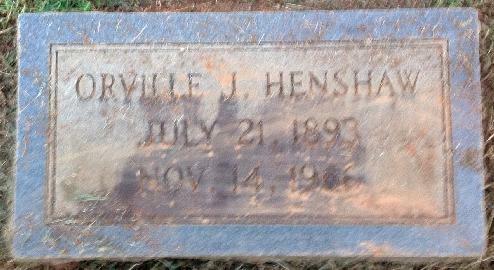 Henshaw, O.K., son, age 6, born in Alabama; completed 1st grade; attended school. Henshaw, Peggie An, daughter, age 3, born in Alabama; attended school. 1900 census, Collins Precinct, Jackson County, Alabama; ED 36, page 208A, line #16, dwelling #57, family #57. Alabama, Marriage Indexes, 1814-1935; http://www.ancestry.com. Alabama, Select Marriages, 1816-1942; http://www.ancestry.com.